Thread: What have you done to challenge yourself? Lately it seems that all the things I've made have been things that I "had to" make and haven't been particularly challenging for my skill (that's not to say that they haven't been fun!). I want to plan a project that's going to push me a little more. What projects have you all done to learn or improve your skills? I want to hear your stories. I'm hoping that if I hear what others have done to challenge themselves it will inspire me. Actually, I'm sure it will! Judy neiemyer paper piecing. It was very challenging. I finished it and my son and son in law have it hanging up. I feel quite accomplished. I started small. David Taylor's method of appliqué. I will not be making a project with a million pieces but I do like the applique method and I will definately use it from now on. I have a bird on a branch that I started in a weeklong David Taylor class. It is one of the million pieces applique. It got frustrating because I don't have the right colors/shades of fabric. But I should pull it out and try to finish it. I have decided to purchase the rulers for machine quilting and learn how to use them. It is only for small projects but they look like fun. My current challenge is taking out all the quilting in a 50x50 quilt. Quilting was just wrong plus a fold in the backing. I can't "live with it". I know each stitch and my seam rippers intimately! Getting involved in the National Quilt Museum BOM. The first block was EPP and the second fabric dyeing and improv piecing. I haven't done either of these. I try to challenge myself on every quilt I make. I try a new pattern first off. I love logcabin patterns and there are a slew of them out there in various shapes. Set-in seams are one of the challenges I tried on a diamond logcabin and found once you figure them out, they're not as hard as you once thought. I love paper piecing but it seems a long time between doing them so I have to re-learn how to do them each time. Laura Aaron Hind quilt books have challenged me. I started with a wonderful group on QB with The farmer's Wife Sampler Quilt, followed by Pony Club, followed by Farmer's Wife 1930, and now I am doing her Bible Sampler six and one half blocks. I never knew how many ways a square could be divided into with 45-65 pieces or sewn so many Y seams. Accuracy is a must. Then I make it harder by telling a story with each block, relating back to its name or childhood stories, especially the Pony Club. I included our shetland ponies pictures, my riding mare with our two daughters on her, my brother's spotted horses and SIL's Irish Mare raced in England and sold by a Colorado owner to her. It is slow work, but worth the challenge to me. Some of it is paper piecing. Curves, and different types of machine applique. I'm also doing more pattern customization, and trying to find ideas to use fabric I already have instead on hand. 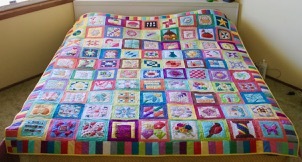 My biggest challenge was a Judy Martin quilt. A little confusing on the layout but I finally got it after calling a friend over to my house and I guess two heads are better than one!!! Love the finish quilt and if I knew how to put pictures on here I would love it. I tried needle turn applique twice. Found out that I am not good at that. But at least, I gave it a try. Teaching my big sister to use my longarm quilter. I'm a 'take charge' type person, so holding back is a challenge and a half. It's going well. We haven't had a fight - yet! The first quilt we did, we made every terrible mistake you can make - in spite of my 'expertise'. It's good to learn how to handle those mistakes with a guide nearby, but I wish we hadn't made them. The quilt came out just fine, by the way. Second one has gone better, but now, at the end of the quilt, we have some serious fluting. I explained how I handle that, but left her to make her own decisions. Later we will finish the quilting. This year I finished The Splendid Sampler. I started a year ago when they came out with a sew along. Took a year to finish. Then it sat for a while until I could have it quilted by my LAQ. I learned tons of new skills. Pat Sloan is coming out with SS#2. Celtic Layers quilt in my avatar was a fun challenge. Jacqueline de Jonge's Enchanting Stars was a harder challenge, (6th picture). I"m just finishing Elizabeth Hartman's "Dogs in Sweaters" quilt. It was a challenge for me. I've never worked with such small pieces where accuracy was essential for the design to come out correctly. My seam ripper and I spent a lot of time together. I learned a lot. It was a good experience for me. I've a Juki on a small frame and am trying to master fmq. Some designs are better than others! I also tried to make a storm at sea by pp. that was a bit of a disaster so I just cut out the pieces and sewers as normal. Lots of cut off points but it looked ok overall. So this year I'm going to concentrate on practising fmq and learning how to pp. I made a Storm at Sea earlier this year - it was hard to make all the points match. I have a mental list of projects I'd like to try... and it keeps growing! I recently was a part of a group which made a Judy Neimeyer quilt for a raffle project for our guild. I am challenged to make one on my own. I am saving my pennies because they are expensive to buy. However, I could not figure it out on my own. Tess, great finish on your Splendid Sampler...that was a lot of 6” blocks. I am working on Jen Kingwell’s Long Time Gone with a group of modern quilters...the blocks have a lot of small pieces which is not in my wheelhouse, but I’m doing my best.